You are here: Home / Kitchen Tips / What’s the Difference Between Baking Soda and Baking Powder? Have you ever been tempted to swap baking soda for baking powder? Can you? 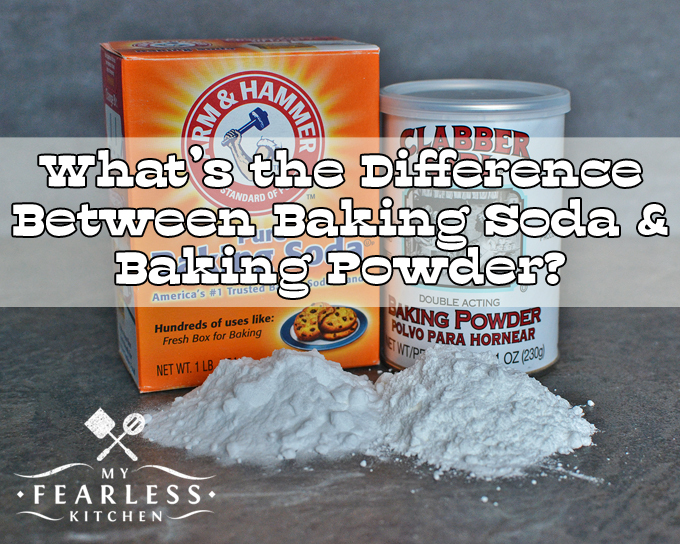 What’s the difference between baking soda and baking powder? Does it matter? Baking soda and baking powder are both leavening agents. That means that, like yeast, they help baked goods to rise. Yeast takes a long time to make breads rise. Baking soda and baking powder work quickly, and are used in quick breads and things like pancakes and cookies. But baking soda and baking powder are not the same thing! Baking soda is sodium bicarbonate. That’s it. There’s nothing else in there. You might remember from grade school science that when you mix baking soda with vinegar you get an eruption. That “eruption” is lots of carbon dioxide bubbles that form when sodium bicarbonate reacts with vinegar. Vinegar isn’t the only thing that baking soda reacts with. Baking soda is a base, so it also reacts with things like buttermilk, yogurt, brown sugar, lemon juice, molasses, and applesauce (anything that is acidic). Once the baking soda reacts with the acidic ingredient, it forms those carbon dioxide bubbles. When this reaction happens inside batter, the bubbles get trapped (thanks, in part, to gluten), and the bread (or shortcakes, or cookies) rise a little and get fluffy. Baking powder is a little more complicated. Baking powder contains baking soda plus two more ingredients. Baking powder also contains cream of tartar and a little corn starch. Remember that baking soda is a base. Cream of tartar is an acid. The corn starch is included to keep the mixture dry and to keep the base and acid from reacting with each other. Most baking powder you find in grocery stores is “double acting.” That means that the leavening happens in two parts – when the baking powder gets wet the first reaction happens and some carbon dioxide is formed. Then when the baking powder gets hot (during baking) the second reaction happens and even more carbon dioxide is formed. Just like with the baking soda, those carbon dioxide bubbles are trapped and the bread (or biscuits, or even cake) rise a little and get fluffy. 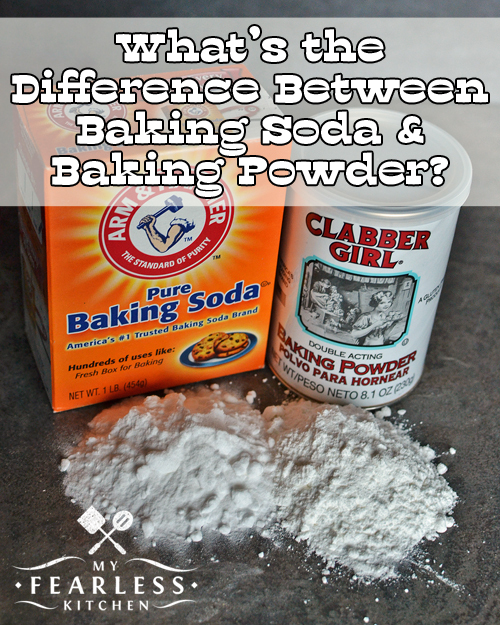 Free Printable Kitchen Cheat Sheet for What’s the Difference Between Baking Soda & Baking Powder? Here’s a graphic so you can tell the difference between baking soda and baking powder at a glance. You can even download and print your own copy here. Can I Swap Baking Soda and Baking Powder? They are not the same thing and can not be used interchangeably. Baking soda is stronger than baking powder (remember, baking powder is only part baking soda). In order to get the same effect during baking, you would need to use much more baking powder than baking soda. Baking powder tends to have a slightly tart or sour taste. If you were to use “extra” baking powder in a recipe that calls for baking soda, the finished recipe will likely have an “off” taste. If you were to use baking soda in a recipe that calls for baking powder, you’ll need to use quite a bit less. You’ll also need to add more of the acidic ingredient (like buttermilk, applesauce, or brown sugar), which will change the taste and texture of the finished recipe. So, don’t swap baking soda and baking powder. And if your recipe tastes a little strange (tart, sour, metallic, or soapy), you might have grabbed the wrong container. Thanks for the info, I never knew all the reasons you could not swap these two items. I just remember my mom saying to follow the recipes and not mix them up!